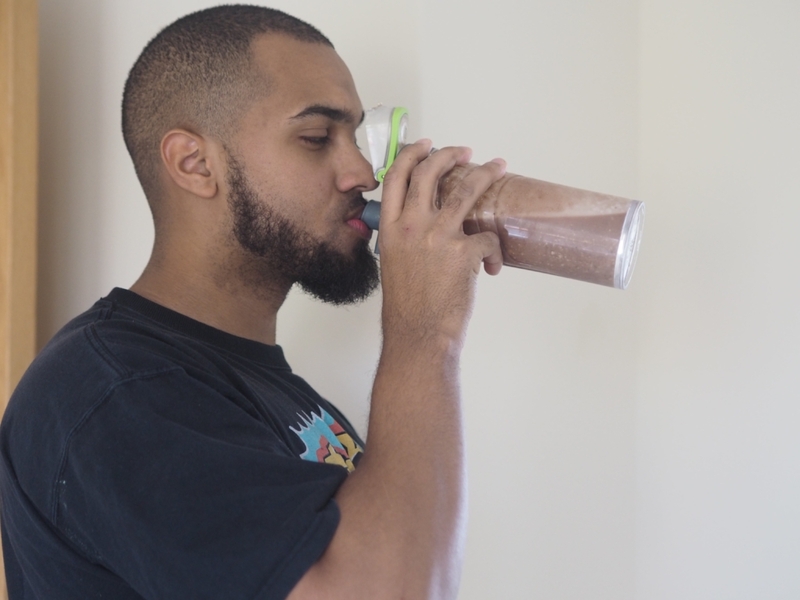 I remember my first protein shake well. I don’t know where I read how to do it this way, but I decided to mix the protein powder with water. Straight. Nothing else. A few minutes passed and my head was in a toilet bowl. I wasn’t doing it right at all. I must have then done some reading, and decided it would make a lot more sense if I replaced that water with milk, and added a few other ingredients to make it as nutritious a breakfast as possible. My whey protein of choice is Serious Mass, based on a tweet I saw once. I’m extremely unexperienced when it comes to this, so there may be better options out there, but their chocolate one tastes good to me, and I’ve never felt the need to stray away from it. As I say, it was difficult to get this down at first. I used to drink a whole one just before work and it was a struggle. It was a gradual thing to incorporate everything in, but I found that the real difference maker was the peanut butter. The rest is pretty functional, but the peanut butter adds to the flavour and the texture – something you’re going to need if you struggle to drink something like this. This has been my personal recipe and it’s been working for me for the past couple of years. I tend to have half first thing in the morning and the second half post-workout. On rest days, I’ll have the whole thing in the morning. Aside from heavier training and lots of water, this is probably the biggest factor in my weight increasing over the past year or so. As it’s worked so well, the recipe is staying this way until someone convinces me that I need to change my ways.